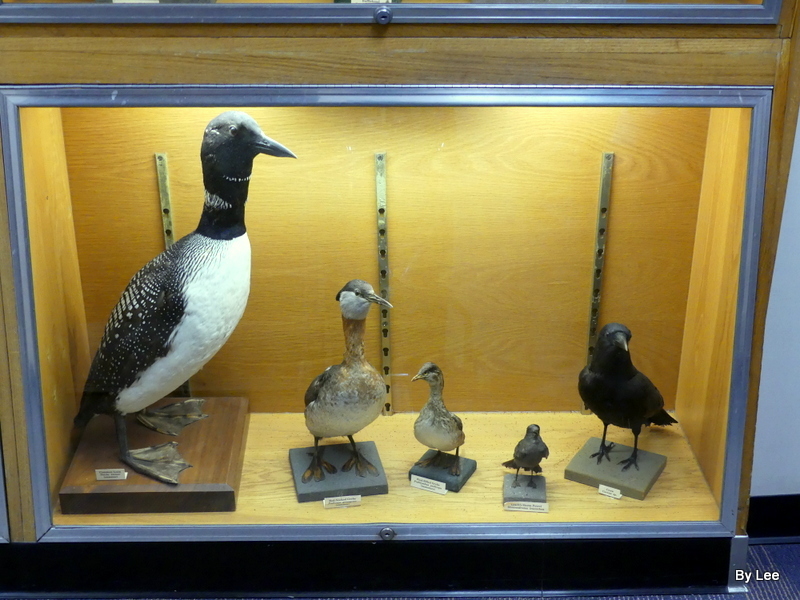 This is the bottom shelf display under the Anatidae Family, just above them. That Family was covered in A Pleasant Surprise – II. I trust you clicked on the links provided to read more about those avian wonders. 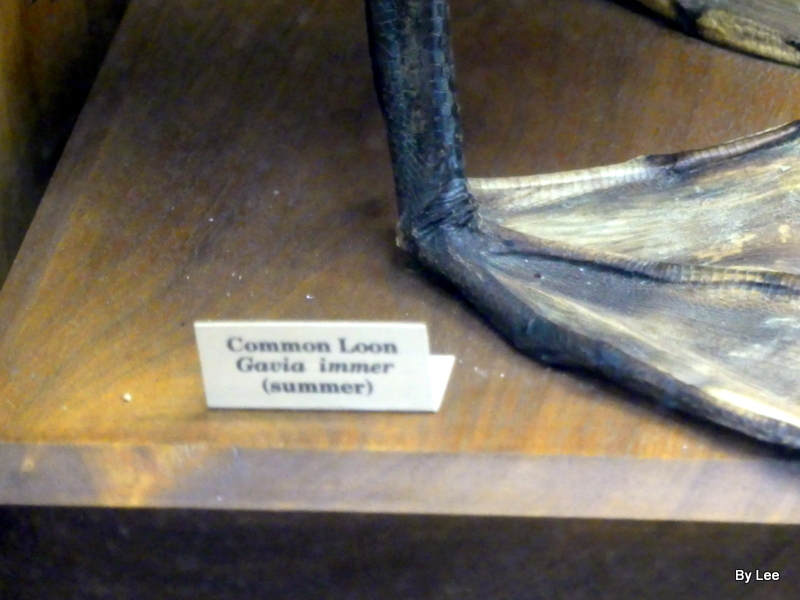 Our big tall bird is a Common Loon. 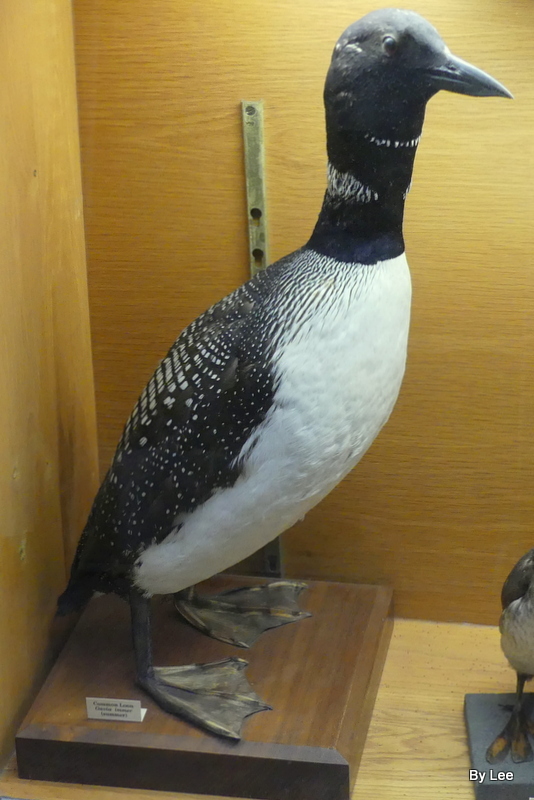 “The common loon or great northern diver (Gavia immer) is a large member of the loon, or diver, family of birds. Breeding adults have a plumage that includes a broad black head and neck with a greenish, purplish, or bluish sheen, blackish or blackish-grey upperparts, and pure white underparts except some black on the undertail coverts and vent. 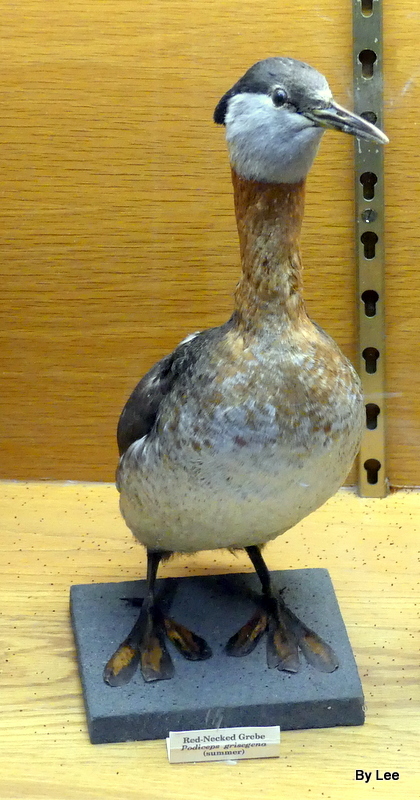 Non-breeding adults are brownish with a dark neck and head marked with dark grey-brown. Their upperparts are dark brownish-grey with an unclear pattern of squares on the shoulders, and the underparts, lower face, chin, and throat are whitish. The sexes look alike, though males are significantly larger and heavier than females. During the breeding season, they live on lakes and other waterways in Canada, the northern United States (including Alaska), as well as in southern parts of Greenland and Iceland. Small numbers breed on Svalbard and sporadically elsewhere in Arctic Eurasia. Common loons winter on both coasts of the US as far south as Mexico, and on the Atlantic coast of Europe. Loons are agile swimmers, but they move pretty fast in the air, too. 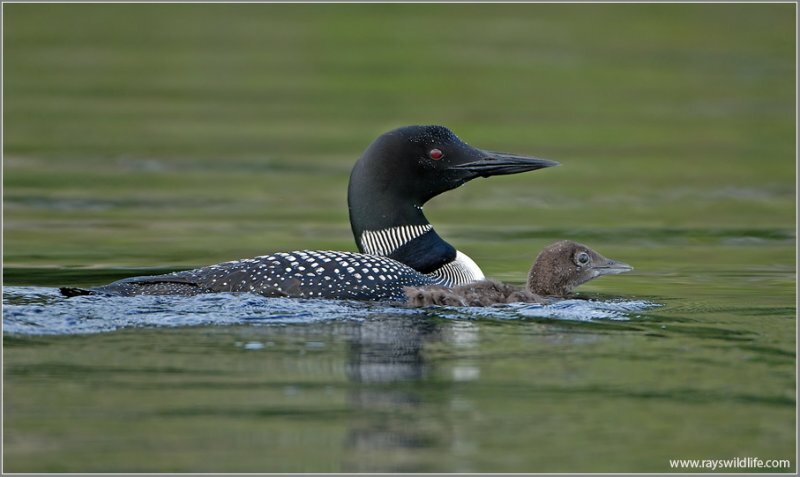 Migrating loons have been clocked flying at speeds more than 70 mph. The oldest recorded Red-necked Grebe was at least 11 years old when it was found in Minnesota, the same state where it had been banded. 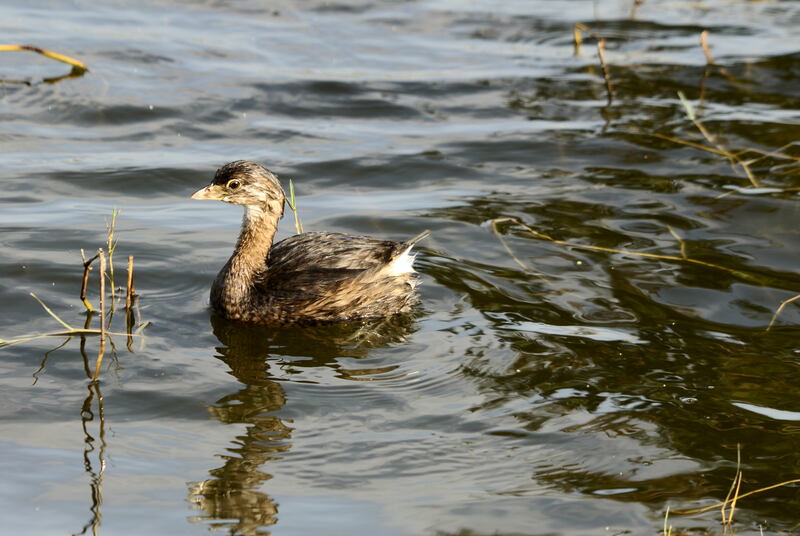 The smaller Grebe, next to the Red-necked Grebe, is a Pied-billed Grebe (Podilymbus podiceps) . They both belong to the Podicipedidae Family. Now that is a bird we see often here in Florida. 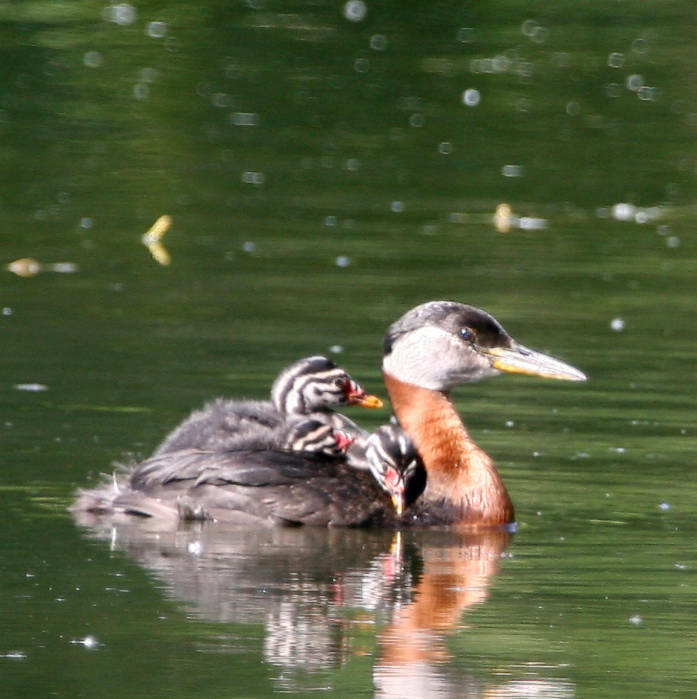 Pied-billed Grebe chicks typically leave the nest the first day after hatching and spend much of their first week riding around on a parent’s back. They usually spend most of their first 3 weeks on or near the nest platform. 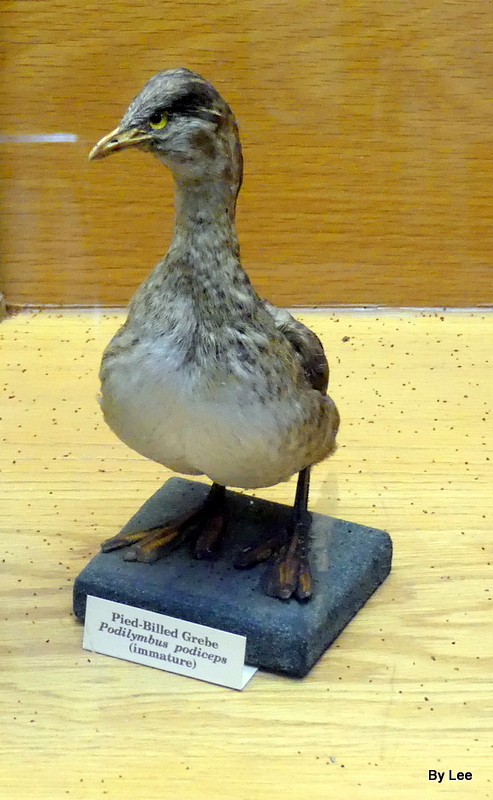 We will check out the other two birds in the display case next. I trust you will enjoy meeting the various birds through this series. The links provided give much more information, and photos of these species. 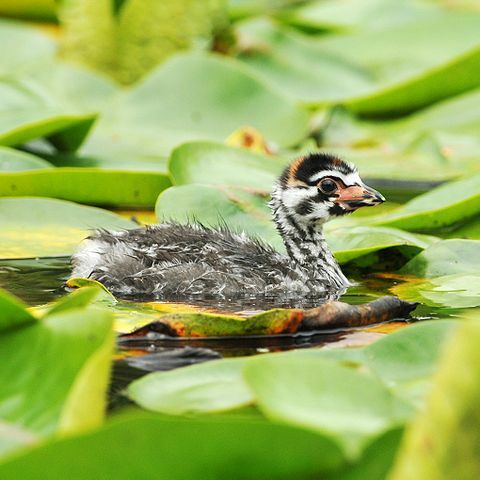 This entry was posted in Birds, Birds of the World, Birdwatching, Christian and tagged Bob Jones University, Common Loon, Creation, Grebe, Home School, Nature, Photography, Waterman Bird Collection. Bookmark the permalink. Probably the first pied-billed grebes that I saw (up close) were on the Snake River, in Wyoming, near Jackson Lake, around AD1990. What cute little ducks they are — and the little ones know how to form a queue behind Mama, as they paddle across moving water!